G-5 VG-Stratocaster, STC-Shaped Guitar from Fender. Roland and Fender introduce the VG Stratocaster G-5, an electronic guitar that fuses traditional design and digital music technology. Combining Roland's COSM modelling with Fender's classic Stratocaster guitar, the VG Stratocaster G-5 gives players instant alternate tunings, a selection of electric, acoustic and 12-string guitar models, and more - accessible with standard controls on the front of the instrument. In 2007, the two companies joined forces to create the VG Stratocaster guitar, the first instrument to blend Roland's digital technologies with Fender's solid-body guitar. The VG Stratocaster G-5 represents the next generation in this partnership, which aims to enhance and expand the potential of the guitar through the integration of instrument design and digital processing. Inside the VG Stratocaster G-5 is Roland's COSM guitar modelling, the same tone technology found in the VG-99 V-Guitar System and GR-55 Guitar Synthesizer. Driven by a GK-3 Divided Pickup, the onboard COSM engine gives the player different guitar sounds including "ideal-performance" pickups, such as a humbucker with ultra-wide range and a single coil with full, bold tone, available by adjusting the Stratocaster knobs and 5-way pickup selector switch. The 20 sounds onboard the VG Stratocaster G-5 include Fender Stratocaster,Telecaster, humbucking, 12-string, acoustic models, and sounds plus five alternate tunings. A Mode Control knob selects one of five distinct modelling modes, while the Tuning Control knob enables players to apply alternate tunings such as open G, drop D, baritone, and others to any currently selected model. In addition, a digital reverb effect is available when an acoustic model is selected. As an instrument, the VG Stratocaster G-5 is a Fender Stratocaster guitar. 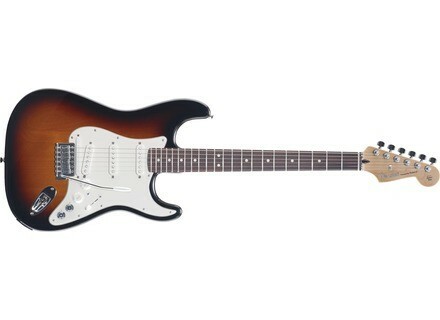 It features a solid contoured body, 22-fret maple neck (with rosewood or maple fingerboard), three American Strat single-coil Alnico 5 pickups with 5-way switching, a synchronised tremolo bridge, a 3-ply pickguard, and chrome hardware. Check out Roland for more details. [NAMM] Vox AC30C2-BL Another of Vox's combo amps presented at NAMM is the AC30C2. [NAMM] Korg PitchBlack Poly Korg introduces the PitchBlack Poly guitar and bass pedal tuners, featuring the 'String Seeker'.